I was delayed with my post today but finally it's time to see what the ladies of Breakfast Club have accomplished. This is June's Breakfast Club project, "3,6,9" This is Marie's completed queen-sized top. I bought this kit too and am still plugging away. Marie had more to share. She took a class using the cotton theory technique where you quilt as you go and have a completely reversible quilt when done. Marie made this placemat...so sorry I didn't get a picture of the other side. Marie made this adorable top for a quilt she plans to donate to her church. This was Marie's final project, July's Breakfast Club pattern. This is "Strip Stacks," from G.E. Designs. It uses pieces that are 2 1/2" x 5 1/2" so it's great for scraps or jelly rolls. I love these batiks. Here is Jane's version. She used scraps from previous quilt projects. What a great way to get a little memento of past projects. This is Kathy's Fall quilt...she just threw it together. Here's another great quilt for the coming Fall season pieced by Maret and quilted by Carol from our group. This is a Lisa Moore pattern, "I Spy Alaska." This pattern works great with theme fabrics. Carol quilted another top for Maret, a "BQ3," pattern from Maple Island. Another pattern great for theme fabrics...this one has snow machines...or as those of you not from Alaska would say...snowmobiles. August's Breakfast Club pattern was a Moda's Bakeshop, "Cross-Terrain." I didn't start this one but is sure is tempting. It is jelly roll friendly...I have a lot of jelly rolls. This is a freebie you can download it here. And here's a preview of September's pattern for Breakfast Club. This screams Christmas prints to me! The little runner is made from the quilt top's scraps. I'm planning on making this one. There's nothing like a day spent quilting with great companions to recharge my batteries. I have lots of quilt pictures to share from our Show and Tell...always the best part of our gathering. One of our creative ladies has designed a "Kuspuk Apron" pattern. Kuspuks are summer parkas Alaska native women make and wear. My Merry Moose doll wears a great example of a Kuspuk. Here are a couple of aprons made by Carol from the soon-to-be-released pattern. I think they are so wonderful! Here's a slightly different version from Erin. The ladies pointed out it would look so cute made up with some "French" fabric. I'll share some quilt pictures tomorrow...you won't want to miss them. I am drowning in emotion. Sunday I said good-bye to my youngest son. I was so proud of myself...no tears. His university is a great fit for him, Western State Colorado University. Lots of outdoor living...perfect for a transplanted Alaskan. 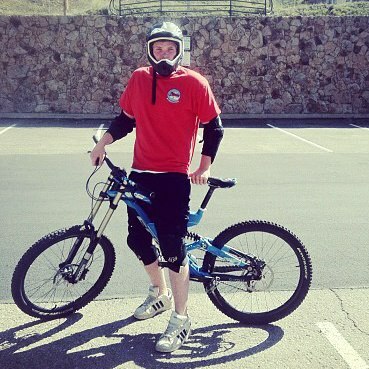 He and his roommate rented mountain bikes and rode some great trails in Crested Butte on Monday. While I was away with my son the dogs tried out a new home. They stayed with my favorite vet tech who is was also a Bernese owner. I saw her last month when I took the pups in for updates on their shots. She was interested in adopting them...but she has two males that have serious health issues. One of her boys has lymphoma and may only have a few weeks left to live. Her other boy has IBD - Irritable Bowel Disease. It went well for all the dogs while I was gone but as I expected...three boys was a bit much. I am thrilled they have decided to keep Jenny...and since they are going through a rough time with their boys...I get to keep Jenny until I leave for Paris in October. I'm now working with a family that I think might be a much better fit for Tonka. I won't say too much else until it's definite...but there is also a third option for him that sounds good too so I'm confident he will have a great new home soon. In the meantime I am trying to work on getting our Alaska house finished. All of the knobs are now installed on all the cabinets...82 knobs and pulls. I hired a professional because that was the only way it was going to get done. Next is the railing on our second floor (yep...it's a little dangerous without it) and then shelves in the closets. I met with a contractor today so I hope his bid comes in at a fair price...I was comfortable talking with him...it is so hard to find people you can trust when it comes to construction. Tomorrow is Breakfast Club and I am planning to attend...and work on that kit I started on at June's Breakfast Club. I won't bother with another picture of almost no progress on the quilt. Rain is in the forecast tomorrow so hopefully I will see lots of my quilting friends there. I could use some female companionship...and chocolate. Maybe I should bring brownies! I bought a Kindle Fire and am trying to finish the George R.R. Martin series "Game of Thrones." Medieval science fiction is how I would describe the series. It's also an HBO series. I'm trying to stay ahead of my oldest son who also loves the series. I'm on the last book...then I'll be reading through everyone's book recommendations on their blogs. I am so glad to have some quilting to share on this Monday. I am working on a "3,6,9" quilt. All of the blocks are sewn and now it is time to trim the panel squares that will be randomly spaced in the quilt. Unfortunately, I can't find my 13"-square ruler which would really make trimming these squares much easier. I have searched everywhere and I may just go buy another one...after all I will probably need one in Paris and one in Alaska right? My pace seems to be two rows sewn together each day. I won't get much done this week as it is time to take my last baby chick to college. We leave for Colorado on Tuesday night. Here's a jolly fellow who is happy to be put together finally. Five more ornaments to go in this Bucilla felt kit, "North Pole." Lots of time spent in on airplanes and in hotels means there is extra time for cross stitch. On this trip I got two Santa ornaments completed. Tahiti Santa on the left and Christmas Island Santa on the right. I guess I must state the obvious...adorable! It's great to have some mindless projects to work on that turn out so cute in a short amount of time. Here's a little video of the Paris apartment we picked. It was the second to the last apartment we looked at on the last day of apartment hunting. We thought we definitely wanted to go with an apartment from the first day that we looked at again right after this showing...so it was a surprise we both agreed on this one! We had a wonderful Paris agent who represented us and handled putting together our viewings, Nellie. She had lived in Miami for two years when her boys were school-aged. It was great to have someone who completely understood how different U.S. housing is from Paris. Each apartment we looked at also had an agent that represented the owner. The owner's agent for the apartment we picked was great. He gave us the feeling their agency would be very responsive to any concerns during our five year lease...to include adding or changing out furniture. Most of the other agents were not nearly as professional or accommodating as he was. We only looked at completely furnished apartments...to include linens. I guess there must be a pretty good market for accommodations like that because we saw plenty and it was considered a down time of the year to look because most Europeans take most of August off for vacations. I'm looking forward to sharing more about apartment living in Paris. Hopefully my French and video skills will improve greatly! Our first day in Paris...the view from our hotel room. The iconic Eiffel Tower! We faced the park in front of the Louvre Museum. In July and August a carnival is set up in the park so you also see some of the rides in the foreground. I think that first day we took the metro to the Arch de Triumph. We didn't fight the crowds to get to the top...see all the tiny people on top? We did a tremendous amount of walking. It was a very successful trip. We found an apartment which I will share video of in a day or two. Most importantly, I will have a sewing room in our Paris apartment. Lots to share but also lots to take care of before we move. My head is jammed with too much information to process right now!